A defensive end in college, Swilling was taken by the Saints in the third round of the 1986 NFL draft. 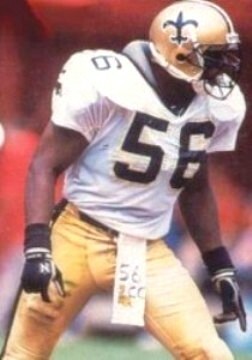 He emerged in his second season as a pass rushing outside linebacker, recording a team-high 10.5 sacks and, in the 3-4 scheme that the Saints employed, was part of an outstanding linebacking corps that included Sam Mills and Vaughan Johnson on the inside and Rickey Jackson on the other side. Swilling was chosen to the Pro Bowl for the first time following a 1989 season in which he garnered 16.5 sacks and was selected again in 1990. Saints went 11-5 to finish first in the NFC West while leading the NFL in fewest points allowed (211) and ranking second in fewest total yards allowed (3933) and passing yards allowed (2720). Lost NFC Wild Card playoff to Atlanta Falcons (27-20). Swilling received a big pay raise in the offseason to keep him from going elsewhere and was again a consensus first-team All-NFL and Pro Bowl selection, although his sack total dropped to 10.5. He was traded to the Detroit Lions in 1993 and, while hampered by an ankle injury, made it to the Pro Bowl for the fifth (and last) time. After a lesser year in ’94 he moved on to the Raiders and, converted back to a defensive end, experienced a resurgence with 13 sacks. He played two more seasons, through 1998, for a total of 12. An outstanding pass rusher, Swilling was weaker against the run and in pass coverage throughout his career. He ended up with a total of 107.5 sacks, making it into double figures six times, and added six interceptions.